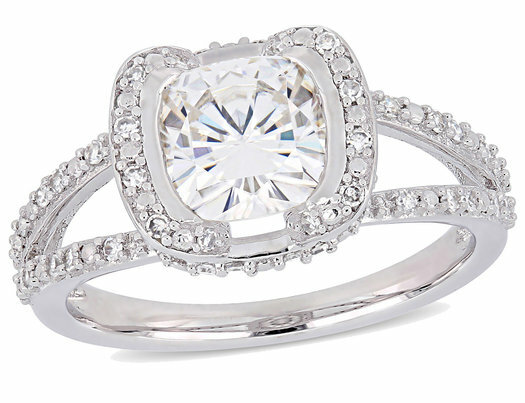 This unique and sophisticated moissanite engagement ring is crafted in 14-karat white gold and features a 2.00 carat (ctw) cushion-cut, channel-set created moissanite at its center surrounded by a 1/4 carat (ctw I1-I2) 50 round-cut, prong-set diamonds in a trendsetting modern square halo split shank design. With exquisite luster and incredible shine, choose this bridal set for your bride-to-be as you celebrate this special milestone and begin the next stage of your lives together. Moisannite is the perfect replacement for a diamond and comparable to or even surpassing the clarity, and color of a diamond.